If possible, visiting our Showroom so we can answer your enquiry face to face, is always the best way of us explaining the options and prices available to you for your Ercol cushions. However, we realise that you may wish to contact us by phone or email first, or you may live too far from us for you to be able to visit. Either way, please see below – we'll be delighted to hear from you! Whatever your enquiry regarding your Ercol cushions, we welcome the opportunity to provide you with the information you seek. If you would like to talk to someone during our office open hours, then please phone us on . We are open Monday to Saturday 9am to 5 pm. We've designed this contact page to make it as easy as possible for you to submit the information we need from you, in order to answer your enquiry. Alternatively, you can e-mail us at . This is especially useful if you are sending us images of your Ercol furniture, to help us identify the particular model you own. If you are sending images, please supply them in pdf or jpeg format. Please note that we will never supply any of the details you submit to us to any other third party. 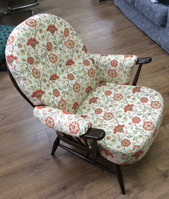 If you have an Ercol Cushion enquiry then please complete and submit the form below. If you don't know the model No. of your furniture then don't worry, but if this is the case we would like you to send us some images of the furniture, please. Please note that we are not asking for your telephone number so we can pester you, simply so that we can talk to you if necessary regarding your enquiry. We look forward to hearing from you. Do you know the model of your Ercol furniture? Roughly how old might it be? Do you remember approximately how much it cost to buy? We are open Monday to Saturday, 9am-5.00pm.